UFC president Dana White has a long and furious history with prominent MMA referee Steve Mazzagatti. "This f**king guy shouldn't even be watching MMA on TV, let alone refereeing it. 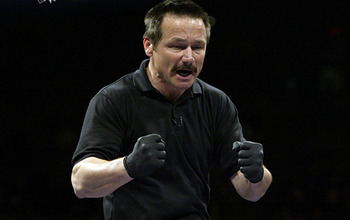 I think he's the worst ref in the history of any fight business, ever. He's horrible. We don't pick the refs. The athletic commission does. Those guys are picked by the government. It's not that I don't like him, he's a nice guy. He's an absolute nice guy, he has no business whatsoever being anywhere near mixed martial arts." For his part, Mazzagatti says he doesn't let it get him down. "Referees aren't there to be popular ... I'm not gonna let it beat me down. I've got a job to do and I pride myself on doing the best job I can. Now Mazzagatti has been picked by the Nevada State Athletic Commission to oversee UFC 132's Dominick Cruz vs. Urijah Faber bantamweight championship bout. NSAC executive director Keith Kizer said of the contest "May be the biggest bantamweight in MMA history, so we look forward to having it and want to have it staffed well." The NSAC made the decision based on recommendations suggested by Kizer. The pool of available officials also included Herb Dean, Yves Lavigne and Mario Yamasaki.